Yoko Ono debuts new DC mural at Union Market Curbed DC . Beatles Radio: The Beatles, Solos, Covers, Birthdays, News The Fab 4 and More! 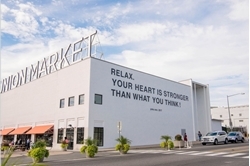 This Friday, Washington, D.C.’s Union Market will debut a brand new large-scale mural along 6th Street NE, completed by Yoko Ono. The Northeast market partnered with the Hirshhorn Museum and Sculpture Garden to complete the project. The mural is the inaugural project of Hirshhorn in the City, an initiative that hopes to exhibit international contemporary artists across Washington, D.C.
As part of the new mural, Hirshhorn Curator of Media and Performance Art Mark Beasley will lead educational discussions on Ono’s work at Union Market.